I decided to start my week off by doing a little something to make me feel accomplished! I completed a meal plan for the week last night and this morning did some lunch & snack prep. In very little time, I put together some trail mix and put 1/4 cup in baggies, then I bagged carrots, jerky, & home dried apples. While all of this was going on, I boiled some eggs. I'm finally getting smarter and put some baking soda in the water while they boil and then cool them in ice water for easier peeling. She can be taught! :) I know it's not much but I feel like I accomplished something useful and am much better prepared for the week ahead! The recipe today was another one I'd been wanting to try for a while. We actually whipped it up with some Smoky Blend grilled chicken on Saturday to have for our picnic lunch. Not gonna lie... I'm pretty sure we had the best lunch of everyone at the park! Check out this fast, easy, and delicious stir fry that goes well with pretty much any protein for any meal! 1. Melt the coconut oil on medium heat and cook the onion until soft. 2. 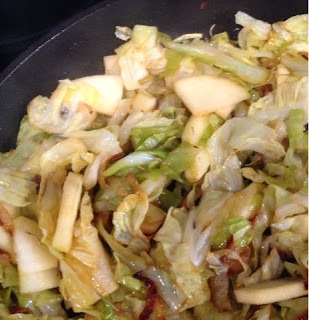 Add cabbage & cook until it begins to soften. 3. Add the vinegar, rosemary, & salt and allow the mixture to cook until fork-tender. 4. Add the apples and cook them until soft. If the the mixture becomes too dry add more vinegar. Have you made time for self-care/love today? I decided to do a few minutes of yoga to clear my head and get loosened up for my Monday night volleyball games!